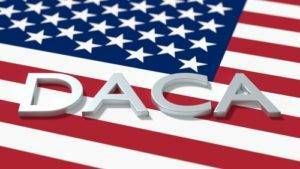 In September, the Deferred Action for Childhood Arrivals (DACA) program was dealt a fatal blow by the Trump administration. The litigation the DOJ is referring to is a threat by Texas and four other states to seek a court ruling striking down DACA. According to the press release, the DOJ has chosen to capitulate to Texas instead of fighting in court. Besides possible litigation, the DOJ attempted to justify the move by offering a set of old and debunked arguments claiming that immigration depresses wages and adds to the welfare rolls. In fact, after DACA was established, whole communities saw an improvement in the quality of life. Under DACA an estimated 800,000 young people, including over 75,000 LGBT people, have been protected from deportation and have the authorization to work in the US. Under DACA their wages increased by as much as 40%; 46% of them are attending school, and over 90% were able to obtain a driver’s license or state ID. DACA is not a pathway to citizenship; it is merely a delayed enforcement of deportation proceedings that enables its beneficiaries to work “on the books.” From a public policy perspective, DACA meant more people paying taxes (people who, as non-citizens, cannot collect Social Security or other federal benefits), and more people contributing to the economy. There is a six-month delay before the change in policy will take effect. According to the administration, this window is intended to allow Congress to pass Immigration reform. Presently four Republican Congressmen, including Frank A. LoBiondo, Congressman Tom MacArthur, Congressman Christopher H. Smith and Congressman Leonard Lance, are on board for a new DREAM Act to continue the protection of young people who came to this country before they were making their own choices. Call or write your Congressmen and thank them if they are one of the four or encourage the others to join forces. This gives me hope for the future, and I will keep in touch with any new developments!